Every once in a while I read a book and then feel very intimidated about reviewing it, because I’m afraid I just won’t be able to do it justice. This is one of those books. Apparently, Stephanie Nielson is very well-known; she has a blog, Nie Nie’s Dialogues, which garnered a pretty sizable following even before the life-altering event that is the subject of her memoir. She’s also been on Oprah and has appeared elsewhere to speak. How it is that I never heard of her until her book was released a couple weeks ago, I have no idea. Fortunately, her book was brought to my attention, though, and I’m so glad. Growing up in a devout Mormon family in Utah, Stephanie wanted nothing more than to be a wife and mother. Those dreams came true soon enough; she met and fell in love with Christian Nielson, and they were married by the time Stephanie was nineteen. They seemed to have an idyllic life together: utterly in love with each other, buoyed by their shared faith and the love and support of both of their families, and plenty of babies. Then one fateful day in August 2008, the young couple left their four small children in the care of grandparents and took off on a day trip via Cessna. Christian had recently earned his pilot’s license, and they were up for adventure, along with Christian’s flight instructor and friend. They spent a beautiful day flying to New Mexico to visit Christian’s family’s ranch. En route to home, the three stopped to refuel the plane, and shortly after taking off again, one of the small plane’s engines stalled and the plane crashed. Doug, who was at the controls, did not survive. Christian was burned over 30% of his body and suffered a broken back, and Stephanie was burned over 80% of her body. For three months, Stephanie lingered in a coma between life and death, her survival a huge question mark, and the very real possibility of amputation of her limbs hanging in the balance even if she did survive. 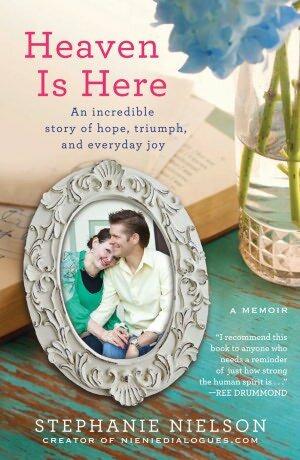 Heaven is Here tells the story of Stephanie’s horrific injuries and grueling recovery, in her own words. Always spurred by her deep faith and devotion to her husband and children, she nonetheless travels some very dark emotional roads and almost unimaginable physical trials. I was in tears so many times throughout this book, and found myself mentally raising a fist and cheering for this young woman. In the end, life looks much different than it had before the accident, but still extremely beautiful. This is a heavily faith-based story, and I confess that I have trouble with those kinds of stories. However, she’s not at all preachy, just very honest about the resource of religious belief that she was raised to rely on. Beautifully written, the book reveals an author who is humble, genuine, introspective, and utterly grateful for all her life is comprised of, difficulties and all. Just started this book myself, it’s great so far! I had a sample of this book on my Kindle when I read your review. After reading your review I read the sample and then bought the full book. So far I’m finding it a very good book. I enjoy your book reviews. I did see that video shortly after I finished the book, Heather. It’s always really neat to get to see the face and hear the voice of an author whose story has moved you. Love your eclectic reading selection! Life’s too short to read anything but what you really want. Dump all the boring stuff that’s still waiting for you. I came here from DS mama’s site. Saw your review of KH’s book. Enjoying all the talk of you intelligent women. Didn’t read KH’s book. Not interested enough, I guess, but I have seen her blog. You guys are too hard on her. I like her brand. Maybe it’s because there’s not enough pretty in my environment (too much dirt, and need for remodeling.) Anyway, she’s young. Their generation thinks differently. You really can’t go home again. Same experience when I tried to read “Little House” books, and “Little Women” to my kids. Ditto for “Chronicles of Narnia.” Amen about tedious. I don’t really want to spend three pages learning how to make a leather hinge for a door. Best children’s books I’ve read as an adult: “Peter Pan” and anything “Pooh.” Love, love, love the Use of the Capitalized Word to Convey Importance! Haven’t read much over the last few years, especially since I got laser eye surgery. Used to love anything by Georgette Heyer (although now that I’m older, can see a lot wrong with her outlook, such as “breeding will out,” still, fun) and of course, the queen, Jane Austen. The 6 hr BBC series is the best rendition of “Pride and Prejudice”– really, almost word for word, and casting is exquisite. Sorry to hear that you’re an atheist. Didn’t think I beat anyone over the head with my beliefs, but on reviewing my blog, saw that I do. Oh well. I’m happy at my age to be at peace. Youth is for running around (mentally,) trying to find yourself. I always tell my kids, “Truth is truth, regardless of what you think or believe. Your beliefs have no effect on truth. At some point, you have to make a decision about what you’re going to believe, and who you’re going to trust. Here’s my choice.” Guess we’ll all see in the afterlife! Don’t mean to be condescending, but I can’t help it sometimes. I just finished reading the book and I loved it! What an inspiring woman!